Baby's got some crazy big eyes, right? I definitely never thought I would be a stay-at-home mother. I had been thinking to have a drug free childbirth... let me say that was a crazy, ignorant idea. Labor hurts beyond any description/my imagination. I do not know how anyone can choose it. After an hour I was like ok, I give up, I will do anything to make this stop. I was 1 cm dilated (it goes up to 10 cm, and gets progressively more painful) and I was vomiting violently from the pain. Also throwing myself against the floor, over and over, begging Jonathan to somehow help me. I have a memory of screaming in a cab, and the cab driver trying not to look at me. I can only compare it to those immensely painful charley horse cramps in your calf, but in your abdomen. For 24 hours. Or in my case 28. Once I got the epidural, I was narcotically happy, the floatingy best I have felt in years. the actual pushing bit was not hard and really quite fun. So now I'm at home with baby for -- well, kind of a long, stupid story involving some incorrect paperwork-- but hopefully 2 more months if I can fix it-- possibly 1 more week if I can't. I'm definitely gooey eyed gaga over Noah a lot of the time. Although it's also tough to have a relationship with someone who screams if he's slightly unhappy. I spent last might from 11 to 12:30 am holding him in my arms dancing around the bedroom, which was the only way to keep him quiet. I guess this will help me lose the baby weight. Many days go by with a bare minimum accomplished. Basically every 3.5 hours, I spent 1.25 hours in a strict routine of changing his diaper, breast feeding him, changing his diaper, bottle feeding him, changing his diaper, pumping milk, changing his diaper, cleaning the bottles/pump. Then I have an hour and a quarter where he sleeps (and I sleep, eat, do laundry, tidy the house, answer emails, make food, write an endless series of thank you notes for baby gifts) and an hour where I talk to him, rock him, sing to him, read to him, jiggle him up and down, and whatever else I can do to amuse him/stop him crying. It's a weird, lazy-but-exhausting routine. I definitely can feel it affecting my memory: maybe it's hormones or maybe it's lack of sleep, but I feel I'm at about 75% of normal mental processing speed. Despite this, I'm becoming more efficient at housewife type things, mostly thanks to Amazon Mom (like Amazon Prime, but with diaper discounts), and, I guess, practice. I can also do many more things with just one hand. I only leave the house on average once every three days. I don't know how people live when they have either multiple children or no washing machine. I find myself making time tradeoffs like "I have 60 seconds before he screams: what's more important, putting in my contact lens or getting a glass of water?" "4 minutes: breakfast or shower?" It's the first year in maybe 10 that I haven't played in the National Chess Congress and I miss playing chess, although I feel quite incapable of casually going back to it right now. more soon, maybe. Totally cute!! Congratulations to the new parents! I'm glad for you all! What a big success!! Happy Thanksgiving, too! You would probably have found the tournament interesting. Loews has a pretty nice venue there as far as the tournament hall goes, but the foyer being all marble and steel and whatnot, it gets loud out there. And the hallway for the wall charts is pretty cramped when you put a couple of hundred milling chessplayers in it. But the event itself was pretty good. You've probably seen the crosstables already--no ties in the U2200 section until you get down to third place. First of all. Congratulations! May you and your family be happy, safe, and well this holiday season. My children bring a lot of meaning to my life. I love them very much. You are going to be a good mom, you and your son and husband will all educate each other and negotiate it out. He looks just grand! I hope the paperwork all sorted itself out. There will be time for chess and other things in time, but I'm glad in this time and space you are getting to have the full-fledged Noah experience. 28 hours! My goodness. Hello Noah, love your big bright eyes. Back when I had my daughter I was able to pay the bill off in six months, no way could you do that today. This was 1965. Such a blessing to you and your husband! There is nothing more precious than a child come into one's life. I wish YOU all (Noah included, what a fab name, BTW!) a wonderful and prosperous 2014. Congratulations on your beautiful boy Noah, he's quite the looker. I realize this isn't the appropriate venue, or time, but I recently finished up my doctorate in Ed Psych and learning theory and would love the opportunity to chat or have an email exchange about what you do, say, and have your students do when you replay games with their notes. I am a firm believer in linking strategies to performance and empowering children to take control of their learning...needless to say, your interactions during those replays are incredibly powerful. If you'd like to chat please email me at mandell.brian@gmail.com. Thank you for your time and congrats again, parenting is such an adventure. Enjoy the ride. Let's see more pics of Noah, LIz. I'm in the middle of reading Paul Tough's book, and I wanted to actually check out the blog. It is so fun to look at it while I'm reading the book and see you and Justus and James. 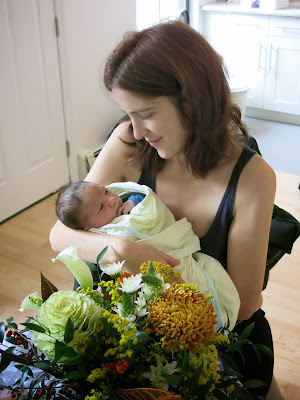 When I first opened the blog I was so excited to see that you had a baby! I'm sure he's going to turn out just fine!! I am a PS teacher in Toronto, Canada. I am at the chapter in Paul Tough's book where he is looking at the connections between coaching chess and Executive Functions and aproaches used in Psychotherapy. I am throughly enjoying the read and reflecting on how it relates to my own teaching practice. Continue to enjoy Noah and your family. I have a blog on blogspot but not sure if it will show up in my Google accoint. I haven't looked at your blog for quite some time now and was pleasantly surprised to find that you're a mother now! Congratulations! I think it's wonderful that you are a stay-at-home mom as I believe it makes for a happier and healthier home. Best of luck on this new "main line variation" in life! Wow, I can't believe you are billed $14,500 for an epidural in the US. In Canada, where my child was born, it costs nothing for an epidural, but then we have universal public healthcare. Anyway, best of luck with all the adjustments to being a new mom. It sure changes your life I know, but I also know you won't be able to imagine life any other way. And I hope you can get back to teaching and playing chess soon. Wow! I've been off teh blogs for quite a while and a needed break from chess.